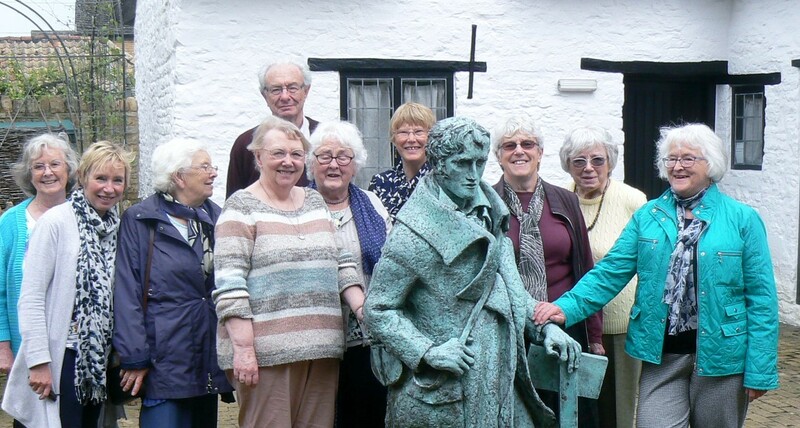 The Poetry Appreciation group departed from the normal meeting this month as we went on an outing. Ten of us braved the rain and the wind to travel to the home of John Clare in Northamptonshire. We had a most delightful time and learnt a great deal about his life and poetry. The lunch was good too! The weather cleared up and we were able to take advantage of the pretty cottage garden and also to look around the village. We may do another visit in the future as this was so successful. The group has a regular following of 13 members. We meet on the 3rd Tuesday of the month. We choose a different poet each month and each of us chooses something to read out. We are a very friendly group and really enjoy our meetings. Recently, we chose John Clare and enjoyed his poetry so much that we are aiming to have a trip to his house sometime in the near future. Watch out for further news on this and if there will be seats to fill for the trip. The poetry group has been going for the best part of 2 years now and we choose a poet to read and discuss every month. Our meetings take place in CRMC on the 3rd Tuesday of the month at 1.30 pm in the Wesley Room. In August we read and discussed Thomas Hardy and were surprised and pleased at the variety and breadth of his output. Our next meeting on September 16th will be on John Masefield, October and November meetings will be on Piers Plowman, Ballad poetry, and at Christmas a free choice of well-loved favourites at our fuddle. Our May meeting was on Ovid The Metamorphoses as translated by Ted Hughes. This proved to be a real hit because of the energy of the translation and the interesting subjects covered by the poems. Next month we are reading Grays elegy written in a country churchyard. We are not a large group and if anyone else would like to join us we would welcome you. We meet on the 3rd Tuesday of the month at 1.30 in the Wesley room. The next meeting is on the 18th June. Patricia Hamling has written this poem, hoping to inspire you. Do come along and give Poetry a try. A gentle parfit crew are we, rambling through vales of poetry. Oft we’ve travelled in realms of gold, from Hamelin to Tintern in tales well told. We’ve sailed on the painted ship, wandered with Byron on exotic trip. Now we are looking for members new, Each third Thursday, could that be you. Our group has now risen to 12 members and our remit remains the same, to read longer poems together so as to gain more understanding of them. This year we are going to branch out from the 19th century and we start next month with Chaucer and the Canterbury Tales. Why not come along and join us? We meet on the third Tuesday of the month at 1.30 in the Wesley room. There is a group of around 12 dedicated participants who enjoy each other’s company and the poetry. We continue to meet on the 3rd Tuesday at 1.30 in the Wesley Room. We have tackled poems by Browning, Tennyson and Byron and this month we move on to Shelley. There is room for more of you and if anyone else would like to join us please get in touch with me Joan Whiting at joan.whiting@ntlworld.com We meet on the 3rd Tuesday of each month at 1.30pm in the Wesley Room of CRMC. We are a group of around 12 regular attendees and so far have read poems by Byron and Keats and other 19th century poets. Our ambition is to read lots of longer poems but we also are beginning to show interest in poems of our youth and to look at more modern authors. The format is very simple we sit around a table and take turns to read. When we need to explain difficult parts someone comes up with an answer which usually satisfies the group. A little biographical detail is included and we all enjoy the satisfaction of reading poetry, something most of us have not done since school. There is room for more of you and if anyone else would like to join us please get in touch with me Joan Whiting at joan.whiting@ntlworld.com We meet on the 3rd Tuesday of each month at 1.30pm in the Wesley room of CRMC.